EMerald Gemstone is an extremely precious gemstone. . Panna Gemstone appearing highly transparent without any dark specks inside is the highest quality and is priced very high . Mercury planet, supports professional fields like banking, accounts commerce, and brings success in these Career Fields , Thus Persons in These Fields are Best recommended to wear an Panna or Emerald. Persons whose Horoscope has Mercury being afflicted by malefic planets and placed in weak position in ascendant are is likely to face disputes, litigation, and loss through theft, loss due to fraud, cheating and forgery. Thus wearing a Panna for Such persons is very Beneficial. For Persons Born in Ascendant or Rashi of Virgo Rashi or Gemini Rashi This this the Gemstone for Life for them. As Per Numerology Persons Born on 5th , 14th or 23rd of any Month get Mean Evaluated Number 5 . Thus This is the Best Gemstone for Persons Born on date Totaling Number 5. Panna Gemstone is Very Vibrant and highly attractive, Panna gemstone holds a top-notch position amongst gemstone lovers. There is no as such restriction that who should wear emerald stone. But its Always Advisable to Get Proper Advice from any Professional Astrologer Before wearing a Panna Gemstone. In Today’s Highly Stressful and Competitive world Many People suffer from depression or mental Stress Thus they Should wear this gemstone to get rid-off these severe diseases. Panna is Also Considered a Gemstone of LOVE . Thus Persons who are facing problems in their love life or married life can definitely wear this Gemstone this stone. Persons Suffering from Negative effects of nightmares and evil spirits are invalidated by the use of this gemstone. Better peace of mind helps the person perform better and lead a tuneful and prosperous life. Regards – Amit lamba – (Mobile ) 9819015736 . Original Panna Emerald GemStone for Mercury Planet . Panna is a Beautiful precious stone that represents the planet Mercury, The Powerful effects of Panna Emerald Gemstone are most popular , As Per Astrology Its is Said that They say that the wearer of an Panna Stone gets a powerful Sharp mind and Gives a Person fantastic Growth in education . Panna is Also a Gemstone for Businessmen and Helps Take Rational Decisions in business Its Very Helpful in creative fields such as writing. Panna gemstone increases the brain power, intelligence, memory, communication skills and speech. Peoples whose Mercury/Buddh is weak in their Horoscope Or Who Have Mercury in Pisces Rashi in their Horoscope Should Definitely wear a Panna. Wearing a Gemms Stone Helps You make your mind sharper. Emerald Panna is the Gemstone which the Planet Mercury Loves . 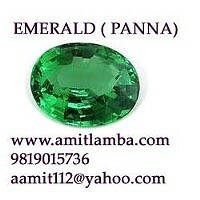 Panna Stone is Among the 5 Gems Known as the PANCHRATNA.